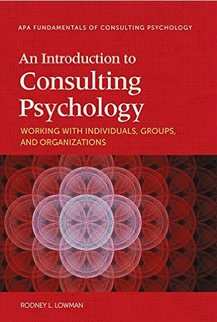 An Introduction to Consulting Psychology: Working with Individuals, Groups, and Organizations by Rodney L. Lowman, PhD, Distinguished Professor, CSPP/Alliant International University. Available now at: www.apa.org and amazon.com. Consulting Psychology Journal: Practice and Research seeks to advance knowledge and practice in all areas of consulting psychology. Consider submitting your next article to CPJ and learn about its new Development Editor Assistance program. CPJ is the official publication of the Society of Consulting Psychology (APA Div. 13) and is a benefit of membership. Co-Editors: Carolyn F. Humphrey, PhD, The Consulting Psychology Group, Charlotte, N.C.; Karen Foster, PhD, Atlanta, Ga.